That question was asked not of President Barack Obama, whose false reassurance about Obamacare earned him the dubious distinction of PolitiFact’s 2013 Lie of the Year. Rather, it was asked this week by Jake Tapper at a CNN town hall event featuring Sen. Kamala Harris, D-Calif.
By the next day, Harris clarified that she would be open to more moderate legislation that preserves private health insurance plans, though it was clear that’s not what she would prefer. Harris is a co-sponsor of Sen. Bernie Sanders’ Medicare for All Act. The Vermont independent’s plan would, among other things, make private health care plans mostly illegal. Explaining her position, Harris said that “having a system that makes a difference in terms of who can receive what, based on your income, is unconscionable.” In reality, however, Medicare and Medicaid are social safety nets designed for the elderly or those with low incomes, respectively. Everyone else freely chooses to purchase health insurance or not. That is not to say that the system works well, and it is not to say that the high price of health insurance doesn’t push many people to forgo purchasing it. Rather, it is to say that a Medicare-style fee schedule would place a binding price ceiling on the health care market. Basic economics tells us that health care utilization would increase as provider workforce supply would decrease, resulting in a shortage of health care. Harris can seek to mandate health care coverage for all, but without providers, none will have it. The California Democrat is absolutely correct that the paperwork requirements of health care are an enormous burden on the system, and those absolutely need to be addressed. In much of primary care, physicians are spending up to twice as much time on their computers as they are with their patients, and a majority of physicians feel they are working at or beyond their capacity. Harris thinks that Medicare for All would fix these issues, but there’s little to suggest that increasing government involvement would streamline health care delivery. On the contrary, numerous quality metrics and constantly shifting clinical requirements originate from Medicare, which is, after all, the model and namesake for Medicare for All. As a case in point, outdated documentation requirements in the form of the evaluation and management codes—a major factor in an administrative burden that has been in place since 1995—are a requirement set by the Centers for Medicare and Medicaid Services. Harris may be interested to know, however, that reducing the administrative burden has been a priority for the Department of Health and Human Services in the Trump administration. The Centers for Medicare and Medicaid Services has been diligently passing rules, for instance, that eliminate unnecessary reporting measures and simplify payment processes. Nor does government health care provide much optimism for cost savings. A study by the Mercatus Center at George Mason University estimates that nationalizing health care would add more than $32 trillion to the federal budget over 10 years, and that would require tax rates to more than double. Where now American health care spending in large part comprises voluntary transactions, Medicare for All would necessarily compel all Americans to spend a significant portion of their incomes on health care. Looking at more proximal examples of government health care spending, in 2017, the Centers for Medicare and Medicaid Services spent more than $710 billion. By 2018, it covered an additional 2 million patients between Medicare and Medicaid, during which time its budget grew by more than $56 billion, with the largest increases going into Medicaid. That increase represents an 8 percent growth in spending when, in the same period, it estimates that overall national health expenditures grew by only 5.3 percent. 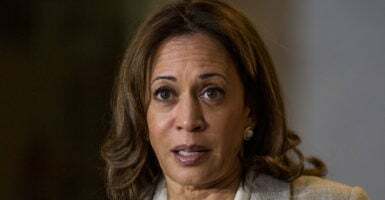 Harris contends that health care “should be understood to be something that all people should be entitled to,” and that not providing health care to everyone would be cruel and inhumane. Her idea, however, does little to address the actual cost and inefficiency of providing health care, and instead stamps price controls on the whole system. Without addressing the underlying issues, nationalizing health care would require either enormously taxing patients or drastically underpaying providers—or as is likely, both. The answer, then, is not to simply mandate health care coverage for all, but something very nearly the opposite. Roll back regulations on the health care markets to allow patients more choice in their care, and reform the administrative regime to free providers from their desks. That way, if you like your plan, keep it. If you don’t, let the market provide another one.